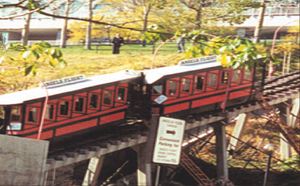 Angels Flight®—everybody’s favorite FUNicular—is there a more iconic piece of Bunker Hilliana? All aboard! proclaims the city of LA! There’s no such repeat incident in the remaining twenty-six years of our hero’s tenure. Dismantled in 1969, reinstalled in ’96, she returns to kill after a scant five years. Why? The Germans, who have a word for everything, have a word for what happened here. Schlimbesserung. Which roughly translates to “the farther ahead we go, the further behind we fall.” It was just this sort of “worse bettering” that has put Angels Flight® out of service. In the seventy years Angels Flight® did its thing, 1913 notwithstanding, all was fine: it was a funicular like any other, and you don’t improve upon perfection—counterbalance, a cable, a safety cable. It’s not rocket science. But then: as is always the case with people, who feel like they have to do something when they have a job, and therefore complicate matters (if this wasn’t a case of trying to “save money,” then it’s got to be nepotism), some City someone hired an entity absurdly ill-suited to the task of restoring Angels Flight®: Lift Engineering. Lift Engineering built ski lifts. Ski lifts that killed people. This character Kunczynski worked on Angels Flight®, added a whole system of independent cables with brake drums interlaced with various gears, which stripped and made the drums useless, and guess what folks, if we’d retained our Edwardian technology, we’d have a surviving survivor (Leon Praport, RIP, survived a Polish death camp, only to be taken out by another piece of ultra-modern cleverness). Kunczynski has fled to Mexico with a briefcase full of your tax dollars. In 1962 taxpayers gave the CRA $35,000 ($240,000 USD2007) to “buy” Angels Flight®, so that the CRA could, according to its chairman William T. Sesnon Jr., relocate the railway in Griffith Park or the Hollywood Bowl. CRA officials change the plan slightly when they announce in September 1968 that Angels Flight® would have to come down—temporarily—to be stored for two years, and then replaced at the same site (shortened, of course, given as they were grading thirty some-odd feet from the Hill). By the time of the CRA’s brief civic ceremony “dismantling event” held in May 16, 1969, they’d already realized the railway would have to be stored until the Hill was completely developed. Surely that wouldn’t take so long. Many long for the return of the cars and restoration of the Flight, and demand that the City get involved—again. Granted, that Angels Flight® is privately run (Welborne’s Angels Flight® Railway Foundation) can mean problems, as anyone who’s ever passed a hat can tell you. Fears of an MTA takeover appear to have been unwarranted, however, and apparently, the long road toward repair may be at an end. People can take all the potshots they want at Mr. Welborne, or execrate the heavens for the very existence of delays in general, but if it takes another ten years, the fact that we’d have Angels Flight® in Los Angeles at all would be nothing less than a miracle.